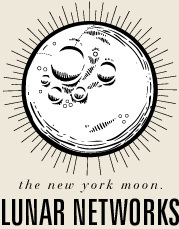 The New York Moon is an internet-based publication adhered to the lunar phases of the real waxing, waning moon. It is collection of experimental, reflective, and imaginative projects that unfold in any medium. The Moon culminates in an “illumination” with every other month’s full moon. The Moon will also take physical form in various ways — one month it may be wheat pasted on a wall and the next it may appear as a prospectus left carelessly on a subway seat. At the beginning of the cycle, Moon editors and contributors get together and talk about the theme and projects for the next edition. The following month and a half is spent working on the projects and tweaking concepts. After publication, a project doesn’t end. There is always the potential for someone to send something to be included on a past project’s page. The Moon is in flux and these rules may be scrapped in the future.